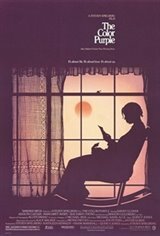 Based on the Pulitzer Prize-winning novel by Alice Walker, The Color Purple spans the years 1909 to 1949, relating the life of Celie (Whoopi Goldberg), a Southern black woman virtually sold into a life of servitude to her brutal husband, sharecropper Albert (Danny Glover). Celie pours out her innermost thoughts in letter form to her sister Nettie (Akousa Busia), but Albert has been hiding the letters Nettie writes back, allowing Celie to assume that Nettie is dead. Finally, Celie finds a champion in the don't-take-no-guff Sofia (Oprah Winfrey), the wife of Glover's son from a previous marriage. Alas, Sofia is humbled when she is beaten into submission by angry whites. Later, Celie is able to forge a strong friendship with Albert's mistress Shug (Margaret Avery). Emboldened by this, Celie begins rifling through her husband's belongings and finds Nettie's letters. Able at last to stand up to her husband, Celie leaves him to search for a new life on her own. A major box-office hit, The Color Purple was nominated for eleven Oscars. The film was co-produced by Quincy Jones, who also wrote the score.